You know how in childhood you had that feeling like you want to blow up stuff? Yeah, we all were in that situation when we saw something and we imagine how that stuff can blow in hundreds of pieces. But now your imagination can no longer be just an imagination because in Minecraft you are able now to blow up any stuff and it will be so fun! Think about lands, constructions, maps and any other thing you want! You can make them all explode and you will be so entertained. If we are talking about explosives, I could say that the developer thought about it and added so many explosives so you can get bored. 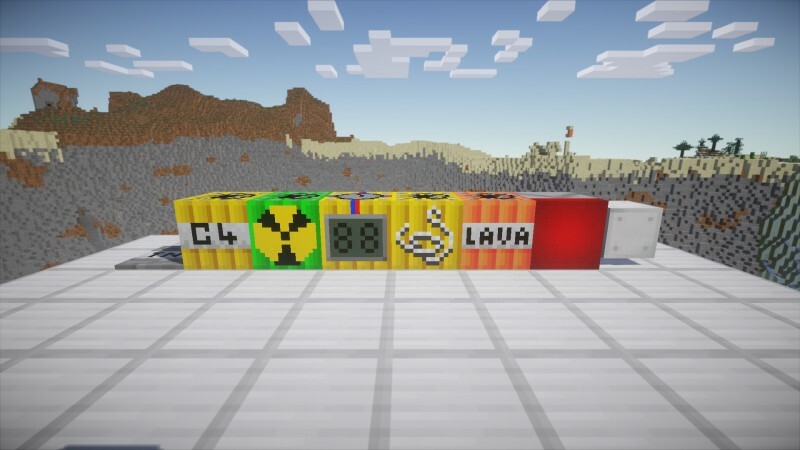 Anti-Personnel Mines, Blasting Caps, Bundled C4, C4, Det Cord, Fuse, Land Mines, Lava Bombs, Nuclear Explosive, Time Bomb, Tunneling Explosive all these will help you to blow up any stuff you want in any way you want. Also, there are tools that will help you to blow up everything, because you can’t just throw the explosives and expect to blow. So the tools are: Blasting Cap Detonator, Defuser, Heavy Matter, Instructions Book, Oil, Plastic, Rocket Fuel, Uranium Rods. Wait! You really think that is not enough!? Well, when you think at explosives, you think about some exploding bombs, right? But what about some combat weapons that will explode up your enemy at one single shot? Take a look at the following list: Bazookas, Bombs, Explosive Arrows Bow, Flares, Missiles, Radar, Smoke Grenades, Water Bombs, Anti-Ballistic Missiles, Molotov Coctails.